"There is no safe level of secondhand smoke exposure," says Ashley Merianos, the lead author of the study and an assistant professor in UC's School of Human Services. "Even a small amount of exposure can lead to more emergency department visits and health problems for teens. That includes not just respiratory symptoms, but lower overall health." The study, "Adolescent Tobacco Smoke Exposure, Respiratory Symptoms, and Emergency Department Utilization," used data from a 2014-15 national survey that looks at tobacco use and related health issues among U.S. people 12 years old and above. A total of 7,389 nonsmoking teens without asthma were included in the study. The American Academy of Pediatrics — which publishes Pediatrics — considers tobacco use a pediatric disease due to the negative health effects associated with secondhand smoke exposure. Despite significant progress in tobacco control, over one-third (35 percent) of U.S. nonsmoking adolescents without asthma were exposed to tobacco smoke for an hour or more within the prior seven days, according to the study. 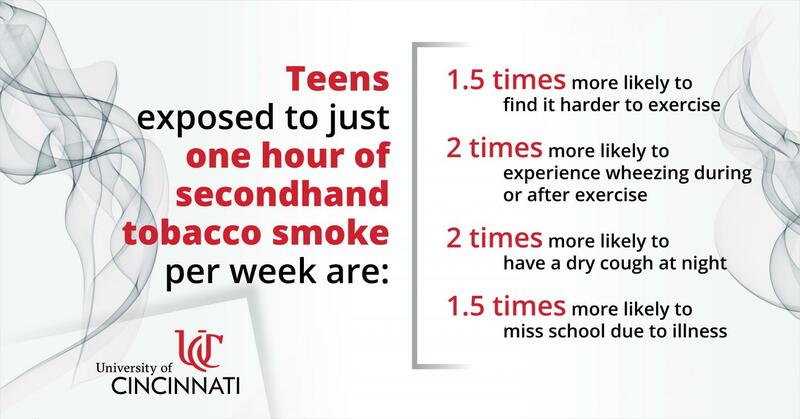 Merianos concluded that more must be done to curb adolescent exposure to secondhand smoke. "Healthcare providers or other health professionals can offer counseling to parents and other family members who smoke to help them quit smoking, and parents should be counseled on how to prevent and reduce their adolescent's secondhand smoke exposure," she says. "Also, health professionals should educate teens on the dangers associated with tobacco use to prevent initiation." Arrange for a follow-up visit or contact. "Additionally, health professionals can help parents and family members establish home and car smoking bans," Merianos says.